Share this product and receive a $0.76 sharing discount. A rite administered to baptized persons, in some churches as a sacrament for confirming and strengthening the recipient in the Christian faith, in others as a rite without sacramental character by which the recipient is admitted to full communion with the church. 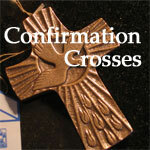 The basic effects of Confirmation are: a) It roots us more deeply in our relationship with God; b) it unites us more firmly with Christ and reminds us that every sacrament we receive is an encounter with Jesus himself; c) it increases in us the gifts of the Holy Spirit: wisdom, understanding, counsel, knowledge, piety, fortitude and fear of the Lord; d) it strengthens our bond to the Church; e) finally, it gives us strength to spread and defend the faith by word and deed. 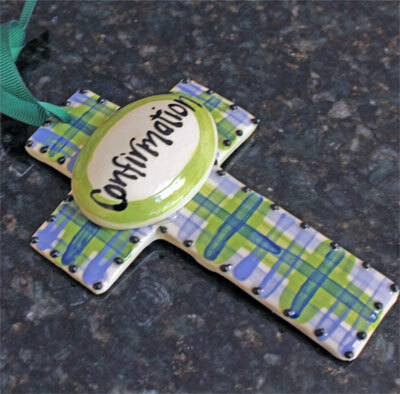 Ceramic cross measures 5" x 3 1/4" and is ready to hang. Handmade in Texas.